2Department of Engineering, College of Chemical Engineering, East Azarbayjan Science and Research Branch, Islamic Azad University. 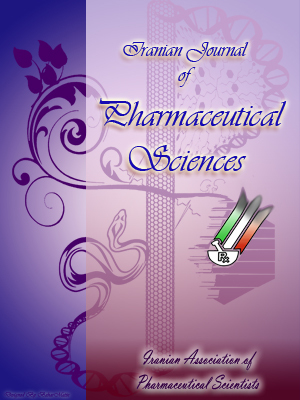 3Zanjan Pharmaceutical Nanotechnology Research Center and Department of Pharmaceutics, Faculty of Pharmacy, Zanjan University of Medical Sciences, Zanjan, Iran. Incorporation of functional foods and nutraceuticals such as carotenoids which suffer from poor water solubility and low bioavailability into nano-sized delivery systems can improve their solubility, stability and oral bioavailability. The aim of this study was to prepare β-Carotene nanodispersion and investigate the effects of preparation parameters by means of response surface methodology using central composite design. Therefore, the impact of the preparation conditions namely the homogenizer speed, evaporation temperature and rotation speed (as independent variables) on the mean particle size, particle size distribution and β-carotene amount of the prepared β-carotene nanodispersion (as responses) were evaluated. A multiple-optimization procedure showed that the optimum conditions of homogenization speed as well as evaporation temperature and rotary speed were 15000 rpm, 32 °C and 140 rpm, respectively. A statistical assessment showed insignificant (p > 0.05) differences between experimental and predicted responses values, verifying the fitness of the final reduced models for explaining the variation of nanoemulsion properties. Using statistical methods can reduce the number of experiments by optimizing of formulations during development and lead to significant save in time and cost.